At Brendon School in England, two boys, Turlough and Hippo Ibbotson (Stephen Garlick), make off with the Brigadiers 1929 Humber 1650 Open Tourer Imperial model motor car. Turlough takes the wheel and, in avoiding a collision with a white van, manages to crash the vehicle. As teachers and police converge on the scene, Turlough finds himself floating in a void, watching the events on the ground. A black robed figure (Valentine Dyall) appears and offers to get Turlough away from the school  if he undertakes to murder the Doctor. Turlough agrees and fades from the void, awakening in his own body. Later, back at the school, Turlough finds that he has a small glass crystal which glows and allows him to speak with the man in black, otherwise known as the Black Guardian. The TARDIS, meanwhile, collides with the warp ellipse field of a giant spacecraft in a fixed orbit in time and space. The Doctor is forced to make an emergency materialisation on board. He and his companions explore the craft, which is lushly decorated and appears to have been in orbit for 3,000 years. They find an empty transmat bay and the Doctor notes that the capsule left for Earth six years earlier. The travellers return to the TARDIS but discover that it is unable to leave the craft as the beam from the transmat is interfering with its operation. The capsule has now returned to it bay, and the Doctor uses it to travel to Earth and disconnect the beam. In doing so he meets Turlough, who was responsible for sending the capsule back to the craft. The TARDIS, now free of the beams interference, brings Nyssa and Tegan to Earth  but unknown to them it has travelled six years back in time to 1977, so they are now separated from the Doctor and Turlough. In 1983, the Brigadier (Nicholas Courtney) arrives and takes Turlough back to the school. Strangely, though, he professes no knowledge of the Doctor. Tegan and Nyssa see the capsule arrive and, venturing inside, find a bloody and injured humanoid (David Collings) whom they assume to be the Doctor. They help him into the TARDIS and Tegan goes to find Turlough. Instead she finds a younger Brigadier (Nicholas Courtney). At the mention of the TARDIS, the Brigadier realises that the Doctor is in trouble. Tegan meanwhile realises that she is in the wrong time zone. The Doctor manages to jog the memory of the Brigadier, who explains that he had a nervous breakdown some time ago. He left UNIT in 1976 and joined the staff of Brendon as a maths teacher. The Doctor mentions Tegan, and the Brigadier recalls meeting her on 7 June 1977  the Queens Silver Jubilee. Tegan decides that the person in the TARDIS is not the Doctor. She and the younger Brigadier hurry back there, guided by a TARDIS homing device. The Brigadier subsequently appropriates this device from Tegan. The creature in the TARDIS has changed his appearance, and it is now clear that he is an alien. On learning more of the Brigadiers memories, the Doctor realises that he can use the capsule to return to the orbiting spacecraft. When he tries to do so, however, the homing beacon explodes. The Brigadier mentions that he has a homing device for the TARDIS, so the Doctor uses that as a substitute. The Brigadier is certain that he didnt travel to the craft with Nyssa and Tegan. The alien in the TARDIS identifies himself as Mawdryn and implores Nyssa and Tegan to return him to the craft. They agree, and the Brigadier insists on going with them. 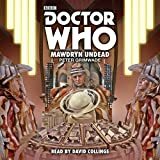 It transpires that Mawdryn and seven similar beings (David Cole, Ian Craig, Mitchell Horner, Michael Leader, Richard Olley, Peter Walmsley, Brian Darnley) have been condemned to endless mutation by the elders of their planet. They exist on this craft, which every 70 years comes close to a planet where they can attempt to find help. They want the Doctor to help them die by giving up the power of his remaining regenerations, but insist that he must do so of his own free will. The Doctor at first declines. He later changes his mind, however, when he realises that Nyssa and Tegan have been contaminated by the mutation and will die if they leave in the TARDIS. The Brigadier from 1977 and the Brigadier from 1983 have meanwhile been wandering around the spaceship, narrowly missing each other. This is fortunate, as the Doctor has warned of dire consequences should they meet. The Doctor links up himself, Nyssa and Tegan to a metamorphic symbiosis regenerator (a machine used by Time Lords to help them through difficult regenerations) which Mawdryn has on board the ship. When the machine is operated, the power will kill the eight Mutants and cure Nyssa and Tegan  but the Doctor will forfeit his remaining regenerations and cease to be a Time Lord. The elder Brigadier activates the equipment, but Turlough  under orders from the Black Guardian  disregards the Doctors instructions to prevent the younger Brigadier from entering the same room. At the moment of power transfer, the two Brigadiers touch and there is a massive discharge of energy. The Brigadiers are unharmed. Nyssa takes the elder of the two to the centre of the TARDIS. The Doctor explains that, at the moment of transfer, the energy came not from him but from the discharge caused by the Brigadiers meeting. Mawdryn and the Mutants are dead, Nyssa and Tegan are no longer infected and the Doctor is still a Time Lord. The ship is also dying, however, so the Doctor hurriedly returns the Brigadiers to their respective time zones. Turlough asks if he can join the Doctor on his travels and the Doctor agrees. They all watch as Mawdryns ship explodes.